Tracy Hogg's incredible sensitivity and ability to read infants' cries, coos and assorted baby noises quickly earned her the admiration and gratitude of high-profile couples, including a host of celebrities. In her bestselling book Secrets of the Baby Whisperer, Tracy demystified the magic she performed with some 5,000 babies. This handbag-sized, easy-to-use edition distils her wisdom enabling parents to work out what kind of baby they have, what kind of mother and father they are and what kind of parenting plan will work best for them. Tracy's practical programme works with infants as young as a day old and is a lifesaver for any new parent. 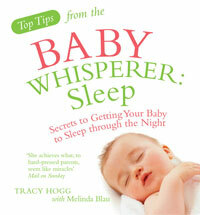 A handy top tips edition of Tracy Hogg's bestselling programme for teaching your baby to sleep. OK, so you know I'd have to review a baby book when I came back didn't you?! I must say I needed these books. My sisters swear by The Baby Whisperer and were all making sure I was using these techniques from day one. Once I understood a little bit more about my baby I was able to get him on a routine, sleeping through the night, and understand his cries. All because of these books. I feel like a better mother. Praise The Baby Whisperer! I would not be sitting here blogging if I hadn't read these books. He would be crying uncontrollably while I would be rocking him thinking he had colic, instead of just being over tired that I was rocking him and not letting him sleep! We have come a long way. If you have a little one, or know of someone who does, you need The Baby Whisperer! This makes a wonderful baby shower gift too!! Found your blog through Kellyskorner! Am now following! Would love for you to check out my blog and follow back! I just had a little one. Sounds like I should read this one.